From the title of this post, you could be forgiven for thinking that it is about Steve Jobs. It isn’t. It’s about me. And I have always been one. Most people know me only for the Free & Open Source Software (FOSS) activities I was (and still am) involved in, so much so that when I talked about building good, commercially-viable products, one insensitive person even said “When did you turn into an anti-FOSS pro-proprietary guy?”. Clearly, the person didn’t spend too much time thinking about what he was saying, given the fact that since the 1980s,I have always been a products & technology guy, not a “FOSS guy”. I have tried to make this clear to people in the past (see this video as an example), but of course some people ignore facts in favour of their own opinions. 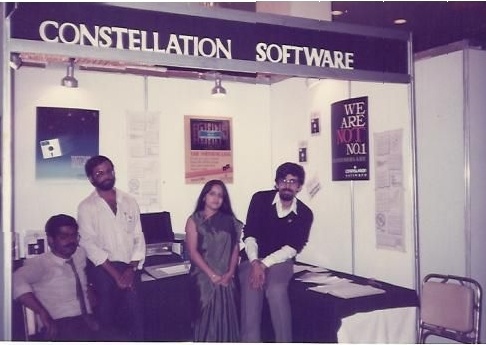 As a quick summary – I graduated in 1985, and since then was involved in building products – first at Compu-Tact (my first job), then on my own, as Constellation Software, where I developed and marketed a series of low-cost, high quality applications and sold them at Rs.100 a piece (“If you won’t buy our software, you are either a criminal, or totally broke”), trying to break the “you don’t have to pay for software” mindset that was the norm in India in those days. We (my partner KH Raju, my wife Shubha and I, with a lot of help from V.Senthil Kumar, who wore a tie even back then ) sold a lot more of these applications than we thought we would. Many people told us that it was the first piece of “legal software” they had ever owned. Companies bought our stuff by the cartload (our first big order was a 100 copies each of our 5 titles – we blew more money on wrecking floppy disk drives than we made off the software! Our customers loved our stuff, and our attitude. I got involved with FOSS & Linux around 1993, but it was less about the ideology, and more about the technology. I didn’t make many friends with that attitude (the event we ran for 10 years, FOSS.IN, was often the target by ideological hotheads who accused us of “betraying” FOSS by focusing on the technology, not the politics). But it wasn’t till 1999 that I actually got involved with the FOSS community (in those days, that meant FOSS users, not developers or contributors). That year, I also started a new company, Exocore Consulting, that focused on supporting people who were deploying FOSS systems, and had no other support available in India. In 2006, I returned to my product roots, joining Geodesic Ltd. to help develop mobile products for the next billion users. Five years later, I am again on my own, but am still on fire about products, and I don’t think that will ever change. So, as you can see, I have always been about technology and products, not about ideology. I am proud of my work in the FOSS world, and I absolutely encourage FOSS as the best way to understand and develop technology, but I do not consider myself a “FOSS-only” person, and if you do, you need to be re-educated. You will also notice that there is a gap between 1989 and 1999 in the time line. In 1989, a few things changed for me. For one, we were expecting a kid in early 1990, and I really needed to up my game in terms of revenues. Our Rs.100 apps weren’t going to put too much food on the table. But around that time, I was visiting one of our customers in Belgaum – a former colleague of my father’s, by the name of V.K.Samant, someone who had known me since 1972, and a person I had an unbelievable amount of respect for. While we were talking about my career options, he handed me a book he had just finished reading, and encouraged me to read it. I wasn’t much into reading biographies in those days (actually, am still not), so I put off reading it till I got back to Bangalore. When I did read it, it changed my life. More about that later. After that trip, we incorporated as ARB Constellation Pvt Ltd, and did two things – sold computers for a living, and created software products that we hoped would change the world. One of these products was a BBS-like communications host called CyberNet that we first used publicly during the Computer Society of India Expo in 1989. That product sold extremely well, and priced between Rs.25,000-100,000 (depending on the configuration, number of users, etc.) made sure we didn’t starve. CyberNet was more than just a product – it was also the first public online system in the Indian sub-continent. Many modem manufacturers credited our system (which carried the name “CiX”) for the enormous spike in the sales of modems in India. Organisations like ABB, ACC, CyberMedia, the Coimbatore Stock Exchange, and many others, deployed CyberNet systems, and even though we ended the production in 1994 (when I shut down ARB Constellation to concentrate on a consulting career), we still supported it till 1999, by which time the Internet had completely replaced its functionality. It was interesting how much negativity and opposition I had to face trying to market a communication product in India. “Use modems on Indian phone lines? Are you crazy?”. “Sell software to companies? Which companies buy software in India? All software is free with the hardware!”. Yada, yada, yada. Oh yeah, the book that Samant Sahib handed me. It was the story about an entrepreneur who set out to change the world, actually did, and then came crashing down. The book was called “Steve Jobs – The Journey is the Reward“. OK, so I lied. This post is about Steve Jobs. It probably wasn’t the best book to read on the subject – unauthorised, written by a third-party, but I was already pretty familiar with Apple and Steve Jobs, so this actually managed to introduce things to me at a completely different level – a lot more human. And it revealed to me some home-truths that would change my life. “You are not remembered for doing what is expected of you”. That was 1989-1990. I had still not heard of FOSS, but I had certainly heard about Steve Jobs and Apple. But it would take another two decades before I ever bought myself an Apple product (a Mac Mini in 2009 – the very machine I am writing this on). So I have never been an “Apple Fanboy” (a phrase some clueless people like to use when they can’t handle the fact that good products deserve customer loyalty), but more of a “Steve Jobs Acolyte”. I never emulated him, or copied what he did (though someone recently told me that my brusqueness reminded her of Jobs), but I used his example to decide how to get things done in my life. On October 5th, 2011, Steve Jobs passed away. And like millions of people across the planet, I too went into deep mourning. I am not ashamed to say that I cried that day, but it wasn’t for Steve alone. It was like something important had gone out of my life, something I didn’t know how to hold back and perpetuate. For me, as a products guy, Steve Jobs was the incarnation of someone who cared deeply about how people felt using his products. In 2010, he made that it clear that “Technology is not enough“, and that you had to bring together arts, sciences, technology and a lot of other things to make great products. And while thousands of people jumped up to write eulogies, give TV interviews, change their Twitter icons, I sat down and thought about what I could do to perpetuate the things that my fallen hero stood for – great products, great product design, extreme customer satisfaction and joy of owning a product you created. This was not to be about being Steve, or even doing the things he did. This was to be about creating a way by which people could taste the success that he did. The Steve Jobs way of getting people to think and work on products was classic – get people together, get them to brainstorm, discuss, encourage each other, understand the future needs of users, etc. That’s how he designed the Pixar offices (with it’s central atrium), and that was how he was designing the new Apple campus. And that is how I will do it. I have decided to create a new event series as a successor to the erstwhile FOSS.IN, an event that focuses entirely on the things that make great products – the tight integration of technology, users, markets, arts and sciences. This year will be the series initiator event. It will be free of politics and ideology (other than “good design matters!”), and it will not restrict itself to any platform (so yes, you will find iOS, Android, Linux, Web and other developers attending and presenting). It will not be about running businesses, but about creating products. It will not be about creating startups, but about the things that startups create. I will write more about this event over the next day, so please bear with me. Team FOSS.IN is working as hard as it can to put this event together, and we should have more details in place in the next 24 hours. We are also going to need a lot of help from the product development community, and, as we did with FOSS.IN, we hope you will support us as we bring this entirely new event series to life. I will be back with more information really soon. Sir,we could only ‘discover’ not create.Creation happens only when there is no ‘how,what,why etc…’(even at quantum level) without answers. Nice to you have changed the comment policy a little. FOSS.IN is something that I will miss forever, however this post gave me a kind of hope that there will be a good conference for like minded people to which I can look forward to attend every year. I am kind of sounding selfish but still …. I guess there is a fine line between (1) improved user experience which is made possible by software freedom and (2) FOSS ideology for its own sake. If I understand you correctly – it is this line which you, reasonably, refuse to cross. While you and I agree that ultimately it’s the user experience which ultimately matters, people of one camp leave product quality out of it while others leave the user’s freedom out of it. An inclusive vision is what’s needed. I am not a FOSS fanatic but I do believe that the user’s freedom is an important component of user experience, which is what people like you and I care about. But yes, it’s only a component and not the end goal in itself. We should take care not to fall in trap of optimizing locally and forgetting the big picture. Looking forward to it. Have a great beginning. Suddenly, the conversation we had over twitter “building products” has come afresh in memory. It all makes so much more sense now. All the very best. Eagerly waiting for details. Touched. Looking forward to this Atul. I thought of buying my first apple product iPad in memory of Steve ! This article given me hints to take his inspiration into products we build, will be very excited to be part of this event in anyways. Looking forward. A welcome change to the usual startup events, looking forward to more details!